Do you ask people to register for your newsletter on the website? Do you have an online application form? Do clients inquire about your services online? Online forms are a great tool for collecting information from your constituents, however, when they are not integrated with your CRM the process of manually entering the information into the database can be overwhelming. Native Salesforce functionality that allows generating up to 500 new leads a day. Native Salesforce functionality that allows generating up to 500 new cases a day. Force.com Sites enables you to create public websites and applications that are directly integrated with your Salesforce organization—without requiring users to log in with a username and password. Powerful forms (Sites are much more than just forms!) that can include any business logic and de-duplication processes. Cost: Contact us for a quote. Visual Workflow allows you to automate business processes by building applications, known as flows, that collect, update, edit, and create Salesforce information, and then make those flows available to your internal users or on your website by adding them to a Site page. Flows can execute logic, interact with the Salesforce database, call Apex classes, and guide users through screens for collecting and updating data. Read more about flows here. Create powerful web forms to collect and send data to your Salesforce account. Capture new leads, update contacts, attach files or open cases with an easy to use Web Form Builder and Salesforce Connector. Cost: $39 per user per month.Nonprofits receive 2 free months. Formstack’s integration with Salesforce.com allows to create online forms for Web-to-lead, Web-to-case, and Web-to-Anything with just a few simple clicks. Cost: Click here for the complete price list. Wufoo allows to automatically generate leads and contacts in Salesforce. Cost: 3 forms for free. Click here for the complete price list. Salesforce has an open API which means that it can interact with other platforms. You can use the API to integrate with your website and create or update any information in Salesforce. Start by thinking about your needs. If you’re just looking to collect newsletter registration or simple inquiries Web to Lead forms might work for you. On the other hand, if you’re looking for updating multiple objects in Salesforce and searching for duplicates Salesforce Sites or third party applications are more likely to have the features you need. Ready to move to the next step? Contact use to receive a quote today. We have used Adobe COLD forms and Wufoo…and for about 80% of client needs Wufoo works just great…and the 3 users for $30/month covers a lot of ground. Thanks for the comment Jordan. Can you share more information about the Adove COLD forms? Pros? Cons? Thanks for this great write-up, Tal! Very helpful. Another Tool I’ve looked at is SurveyGizmo. One nice feature they have is the ability to share forms between accounts – useful if an org needs to manage forms by sharing/editing them between users. Also, it looks like some of your bullet points for “Cons” are copied into the “Pros” section – was that intentional? Thanks again – this is a very helpful post for orgs trying to decide which form building tool to use! Sure thing Ken! Thanks for sharing the information about SurveyGizmo. Also, nice catch on the bullet points. I will fix it now. This is a great resource Tal! Hey Tal – great writeup. Two other considerations for using Web-to-Lead/Case: they don’t easily provide for a CAPTCHA, and as far as I’m aware, are unable to accept attachments. On FormAssembly, a couple things to note as well: it burns through API calls, which for small forms isn’t probably much of a consideration, but if you’ve got other API processes happening and/or large forms (or large numbers of people filling in your forms), there’s always the risk you could hit your API limits using it (or, it could be the straw that broke the camel’s back for hitting API limits). Also, FormAssembly is designed for non-programmers, so if your organization has little resources to pay for ongoing programming needs for Web form integration, or you simply don’t have the technical expertise in house for Sites, it’s a decent (even if less flexible, as you’ve already pointed out) alternative. Hi Tracy & Tal, I just wanted to comment on the number of API calls issue. FormAssembly uses one api call per object created and two per object updated. 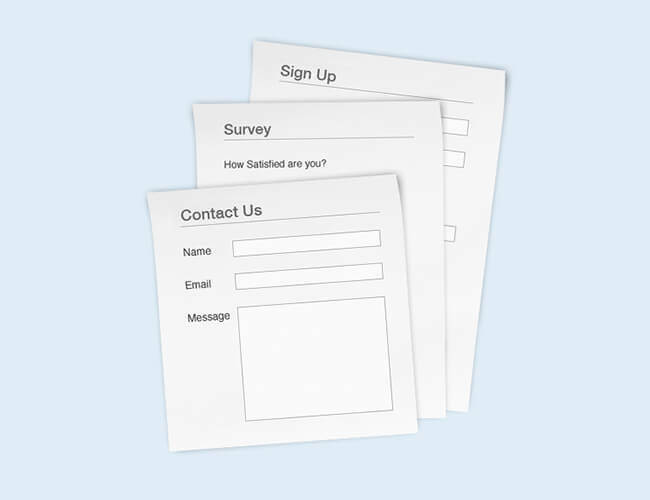 A form can create or update many different objects or just one, depending on your needs. So, while you may hit your daily API limit if you get a lot of submissions, it’s not an issue specific to FormAssembly. You’ll run into the same issue with the other services mentioned here. Also, FormAssembly queues your data if there’s any problem with the Salesforce integration, so you can always resend it the next day when your quota is reset. That’s it, and thanks for the mention! Just wanted to say I’ve used FormAssembly in a variety of contexts and it’s really great. The biggest pro is the “regular user” friendliness of the package. If you’re a small organization who doesn’t have technical resources available, using FA is pretty straightforward. Also, the field mapping is drop-dead simple, and the support team is good. I’m just a very satisfied customer. Hey Cedric – just getting back to this after the holidays. Thanks for the technical clarification re: the number of API calls FA uses. Didn’t mean to appear to single FA out re: “burns API calls” – it’s definitely an issue with any API-based system, as you correctly pointed out. Clicktools is used extensively for forms as well as surveys and call scripts. Point and Click integration with the ability to create/update any Salesforce records, rich branding and it’s used extensively by Salesforce! Are there any basic free tools for a non-profit organisations? Hi Dan, what type of information do you need to capture? Web-to-lead is very basic and free. I heard about FormSite and their Salesforce integration, however, I have not used it. It looks like their integration can do everything you need and they have a 30 day money back guarantee so it might be worthwile to install it in a sandbox environment to test it before you make any decision. Please come back to this post and share your feedback. Thanks, Tal! I certainly will let you know my feedback. One more comment on FormAssembly or any one of this genre is that they store your data on their servers in addition to data being stored in SalesForce. I am personally less concerned with security than I am with complexity. (all of the vendors provide assurances on the security issue). Any time you store data redundantly you introduce a point of failure and of the need to monitor the redundancy for inconsistencies due to communications failure, not to mention synchronization issues such as what to do when one system merges duplicate records. What we need is a forms builder for VF/ Sites that is end user accessible, and my fear that vendors will avoid the market as too small and too vulnerable a business. Thank you for this great web-page. We are a NFP organisation that is looking to use an online store where school principals will register their schools to participate in our One Laptop per Child program. The challenge we face is principals need the flexibility to sign up multiple teachers, might purchase additional spare parts and may keep coming back to grow the program at a local level. We are expecting a huge influx of registrations as the government has signed up for 50,000 XOs and we are now using salesforce thanks to a SF foundation grant. Since we are now building the site from scratch (we were considering WordPress but have move away from it) what are our best options – we have a savvy web developer who can think outside the box and is learning about salesforce integration. What should I tell him is our best option given we need to integrate a ‘shopping cart’ type function. Thanks for your comment! We have a client with a similar needs and we used Nexternal for their class registration. You can read a blog post about Nexternal here: http://cloud4good.com/announcements/apps-for-good-nexternal/ Let us know how it work. The Nexternal eCommerce platform provides Salesforce eCommerce integration through our free application, the ‘eCommerce Connector’ via the Salesforce AppExchange. The ‘eCommerce connector’ is compatible with the Salesforce Non-profit Starter Pack and really easy to setup as you can see on our on our website. After you review this information we can setup a time to discuss your other needs and questions. Feel free to contact me at your convenience. We just recently installed iContact for Salesforce and I’m having a hard time trying to figure out how to create e-newsletter sign-up forms for both Facebook and our website (HTML). Is there not something on the AppExchange that offers a free web-to-lead and web-to-contact creation AND update service? Sara, as far as I know there is no free tool that can do both for free. What exactly does it mean: “Burns through API calls (not recommended for large forms)”. API calls??? I just stumbled upon ZAPIER.COM — probably the most impressive use of forms I’ve seen if you’re looking for Google Docs inegration!! I have a Google Docs Form that upon submission creates a record on a *CUSTOM* Object!! Jeremy, the Zapier integration is relatively new. Last time I looked at it the integration was very limited. I will check it out again. We are using SalesForce to create forms as listed in your demo. Please provide us with information about how to add new fields / components to the form. Hi Harry, what application are you using? We would be more than happy to discuss our support options with you. I work for a wealth management firm, and I have built and administer our SF org. I am looking into potentially utilizing forms as we have multiple use cases. I was wondering if I could speak with you sometime regarding your thoughts on the proper form tool to utilize based on our needs and goals? Please contact me at bdankers@bernicke.com if you are willing to help. Thanks Tal for this great summary! I thought I let you know about another solution which works great for older website which have their own web forms integrated. Those website often send out the form data as an e-mail and the recipient needs to transfer this info manually into his/her CRM. With our email parsing software it is however possible to pull any data fields from an incoming e-mail and push it automatically to Salesforce or other CRM systems. It’s a neat way to do a web > e-mail > Salesforce integration with not much effort.